« Atrocities of ISIS same as actions done in the name of Christ? This article is for Muslims (Moslems) and Christians. This is not an article about the atrocities done in the name of Quran but rather, what differences if any is there between the God of the Bible and the God of the Quran (Allah) and why it matters! I am a student and follower of Jesus Christ and have complete faith in John 3:16 and Romans 10:9-10. I also have a copy of the Quran and have studied it from the perspective of a Bible apologist in order to truly try to understand where a Moslem is coming from and the teachings they follow. This is the root of our quest. While Islam will agree with Christianity that God is Singular in existence, Eternal, No beginning or end, Transcendent, Omniscient, Omnipresent, and Omnipotent, there is one HUGE difference! Islam regards Jesus as a prophet of God but not God Himself. In effect the teachings Islam deny that God’s nature is triune (Father, Son (Jesus Christ), and the Holy Spirit). A possible rebuttal to this from a Moslem would be to state that the Bible is corrupt and can’t fully be trusted as doctrine. But this would bring up a serious contradiction in the Quran. First, in Surah 6:34, 115, and 10:64, the Quran validates itself as being the final authoritative word of Allah and decrees no one can change his words. So if Allah gave the Torah, Psalms, the Gospel, and sent Jesus, how can the Bible be corrupt? When Muhammed (570-632) was alive, he claimed to receive the revelation of the Quran from Allah. This means that at that time the Bible, which was in existence, could not have been corrupted because the Quran states that God’s word cannot be corrupted. Remember that the Quran was put together approximately 500 years after John had finished the book or Revelation. As early as c. A.D. 107, Ignatius quotes from nearly every New Testament book, and Polycarp (a disciple of John, c. A.D. 110) quotes from 17 New Testament books. Muhammad had tried to reconcile his claims with the Scriptures to help validate his teachings. If you happen to be a student of the Quran, you will find that there are many contradictions and errors listed in the Quran that do not match up with the Bible or within itself. 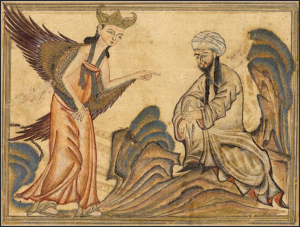 Mohammed receiving his first revelation from the angel Gabriel. Miniature illustration on vellum from the book Jami’ al-Tawarikh (literally “Compendium of Chronicles” but often referred to as The Universal History or History of the World), by Rashid al-Din, published in Tabriz, Persia, 1307 CE Now in the collection of the Edinburgh University Library, Scotland. This is because God’s hand was not behind the Quran’s creation. According to tradition, different fragments of the Quran were revealed to Muhammad verbatim in the course of 22 years (referenced in Surah 17:106 and 25:32). After every occasion, the prophet would recite his revelations to his followers. The question though, did these revelations line up with what was revealed in the Bible? 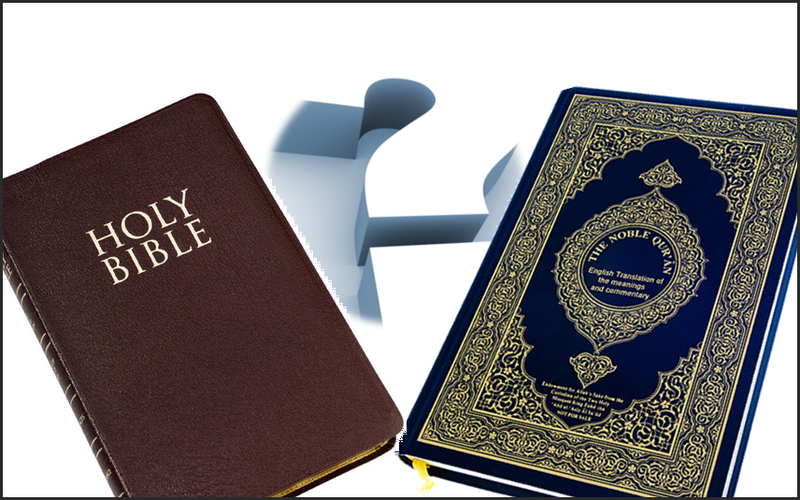 A thorough study shows that the Quran is teaching a “different gospel”. Notice that Paul made a point mention angels in this warning. In history, we see two different angels that gave a false doctrine that referenced but twisted scripture and have led millions of people away from God and the true Nature of Jesus Christ (John 1:1-18). The angel who supposedly was named Gabriel to Muhammad, and an angel who called himself Moroni to Joseph Smith (Mormonism). Both of these faiths are powerful examples of “different gospels” that Paul warned to reject. As for God’s triune nature, also note that through Surah 5 (Al-Maiidah), Allah references himself as “We”. That is a plural term and not singular. Yes, there is one God but He has three natures. In conclusion, I pray that the God of the Universe will reveal Himself to Moslems through His Son Jesus Christ! This link provides some excellent questions and answers and study resources you may have about Islam, the Quran, and how it does not stand up to the test of being part of God’s Word. Tagged Allah, Coexist, Gabriel, God, Gospel, Isa, ISIL, ISIS, Islam, Jesus, Koran, Middle East, Mohammed, Moslem, Muhammed, Muslim, Psalms, Qu'ran, SagacityWeb, Torah. Bookmark the permalink.